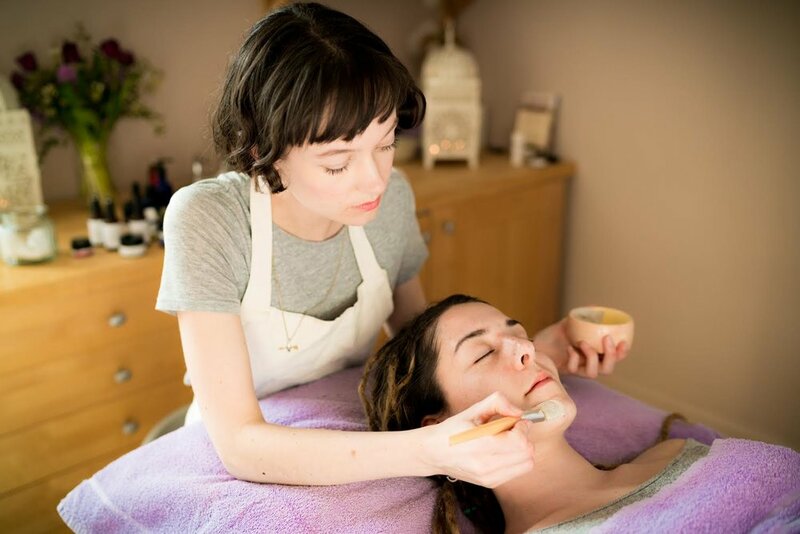 In this blog post our lovely in-house green beauty expert Ellie Gill describes her process and why a natural, green facial is so good for the skin, the spirit and the emotions. I started doing facials almost by accident. I have been working as a freelance makeup artist for ten years and shortly after trained as a massage therapist. Quite a few clients were asking me if I offered facials so I thought why not? I did some training and nowadays this is what I absolutely love doing the most and am lucky enough to spend most of my time doing. I choose I use the A.S Apothecary skincare products because I have found pure ingredients to be incredibly effective. It’s so wonderful that the ingredients are grown locally and the products are made in the same building as the treatment room. The facial serum is my favourite item because it works like magic. I’ve used it on clients with acne and rosacea to great success. I love the way my techniques work in harmony with the aromatherapy qualities of the products too. Amanda has kept the scents clean and simple, I often find that other natural brands combine too many scents which can be overpowering. Our skin is the largest organ we have and absorbs whatever is put onto it, for this reason I would never put anything onto the skin which might contain toxic ingredients. During the first half of your facial I will cleanse, tone, exfoliate and apply a mask. Your hands or feet are then massaged while the masks works its magic then I spend thirty minutes massaging the muscles of the face and neck. Massage is the best anti-ageing solution as it helps boost circulation, and helps to remove toxins from the face leaving you looking glowing and radiant. Find out more about Ellie and our other therapists here.